Andrea Arancon, who owns an online craft supplies store, shares what works for her. Being a mom is already a tough job, but there are women who choose to wear several hats: those of a mother, a wife, and a mompreneur, to name three. How do they do it? 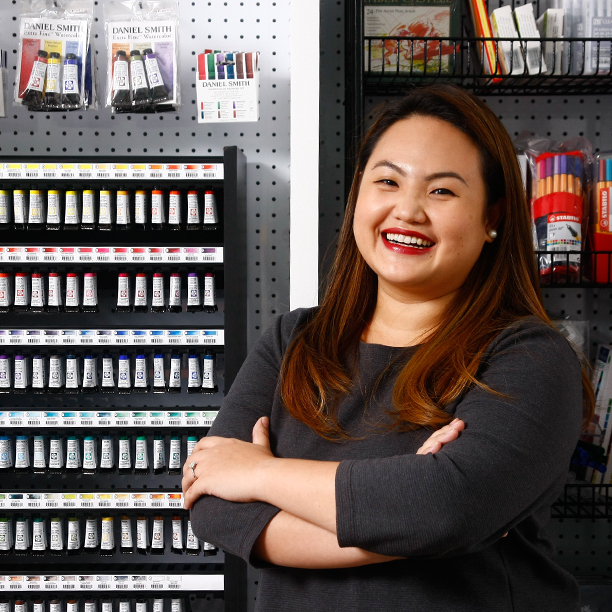 Listen to the words of Andrea Arancon, owner of craft supplies store Craft Carrot and a mom of three: "There are different kinds of fulfillment from being successful as a mother, a wife, a businesswoman. Each one brings a different aspect of your person to life. "You owe it to yourself to explore just how strong and courageous you can be. Fear is normal. If you do not feel scared about your dream, then you have to dream bigger." 1. Pursue your passion and stand your ground. "I think all businesses start with a person's passion for something. It takes a lot more to make it profitable," says Andrea, who has been interested in crafting since she was young. She found that she and her artist friends had a difficult time getting their hands on arts and crafts supplies locally, so they would normally have to purchase things from abroad. And thus, Craft Carrot was born as an online store in 2014. In May 2016, they opened their first brick-and-mortar store in Barangay Kapitolyo, Pasig City. "It was a conscious decision to say that I really believe we can flourish and make this idea big. It took a lot of research, sleepless nights, forging ahead despite naysayers, and a lot of hard work, but when you accept that this is the way for the business to grow, you just buckle down and do what needs to be done." 2. Partner with your life partner. "Without the support of my husband Buddy, starting my own business would have been impossible," says Andrea, who honed her entrepreneurial skills while working for various family businesses. "It was very important that he was there to assure me that he would take care of our day-to-day needs while I ventured on this startup." Having a good staff, both at home and in her business, is also key. "I get to focus on more important things like business strategy and back-end items," she says. "Delegation is key. Do not be afraid to let go of some things that are less important, so you can enjoy your time with your family or get to have time for yourself." 3. Stay in with your family more often. "We had to refrain from a lot of non-essential purchases, and we didn't go out as much until Craft Carrot could start giving me a monthly salary," says Andrea. Staying in also presents an opportunity to bond with your kids. How about a crafternoon session with the kids? Don't have enough capital? Andrea recommends starting small. "If you have a solid idea for a business and you stay true to what your brand represents, the money will come eventually. Also, you have to be smart with the capital you do have. Have a plan, and evaluate constantly if it's working for you." 4. Get your kids on a schedule and stick to it. "I don't think I would survive without my planner and calendar. I color-code activities for each family member so I know which one is for whom," Andrea says. In this way, she is able to take her preschooler with her as she runs errands in the morning, work in the afternoon, spend time with her family in the evening, and then get some more work done before going to bed. 5. Not a techie? Fret not! Andrea's online store is automated by Shopify powered by Globe myBusiness, which makes running the business more efficient. "Inventory checks are done in half the time, order fulfillment just takes a few clicks, and making changes to our website has never been simpler," explains Andrea. "At the end of the day, if we don't sell, we don't have a business, and Shopify via Globe myBusiness helps us execute our vision flawlessly. [That means] more time left for me to be with family." Inspired to become a mompreneur yourself? Create success with the right partner: Globe myBusiness. You don't have to face the challenges of being an entrepreneur on your own. Globe myBusiness helps you keep up by providing innovative and customizable solutions that give you the best value for your money. Sign up for the mailing list of Globe myBusiness and learn how it can help you create success here.